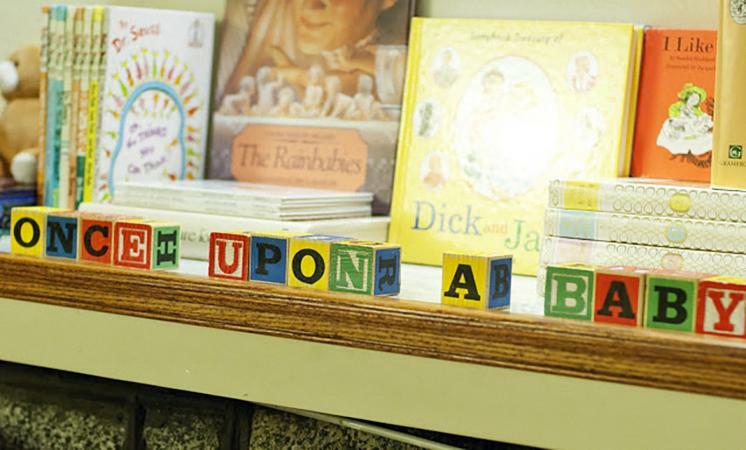 If you're hosting a shower for a mom-to-be who loves books and reading, it's hard to beat a storybook-themed event. A storybook shower can focus on a specific type of book, such as fairy tales, or it can encompass children's books in general. Either way, you'll find that this theme makes every aspect of the shower, from favors to games, to food, easier to plan. A general story-themed shower is a great way to help the mom-to-be create a collection of books for her baby and allow guests to share their favorite storybooks. On the invitation, you can ask guests to bring a book instead of a greeting card, or you can ask them to include a favorite book as part of their gift. You can host this type of shower anywhere, from your home to your favorite park. However, if you want a location that works well for this theme, consider your local library. Many libraries have meeting rooms you can use as long as you work out the details of food and drink and keep noise to a minimum. Another option is a bookstore cafe although you'll need to purchase refreshments for the group from this venue. 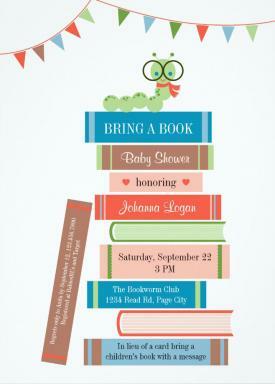 For invitations, choose a card with a book theme, such as the Book for Baby shower invitation from Zazzle. This faint blue card features a stack of books with a bookworm on top and you can customize it with your choice of colors, the mom-to-be's name, and other party details. It costs $45 for 25 cards. Stand up your favorite children's books on every surface. Decorate with book posters, such as those available from AllPosters.com. Most cost between $10 and $30. Make miniature books out of photocopied paper and cardstock and hang them from the ceiling at various heights. The favors should also fit with the theme. Consider giving guests a bookmark, such as the free, downloadable black and white bookmarks from Pretty Providence that use the quote "Children are made readers on the laps of their parents" by Emilie Buchwald. You can also purchase personalized reading quote bookmarks from Personalization Mall. You get a set of four different bookmarks, each with two lines of custom text for about $5. For food, you can do almost any type of shower-appropriate menu. Consider a finger food buffet, so guests can easily eat and mingle. You can incorporate your theme in the cake design. Ask the bakery about making a cake that looks like a stack of children's books. On the "cover" of the top book, you can have a message congratulating the mom-to-be. Write down quotes from well-known children's books and have guests guess which book the quote came from. Divide guests into teams and have them play charades with children's book titles. Create custom bookplates for the baby's nursery, using adhesive paper, colored pencils, and other art supplies. A fairy tale shower is a fun variation on the storybook theme. This type of party is perfect for the mom-to-be who loves classic children's literature and magical stories. 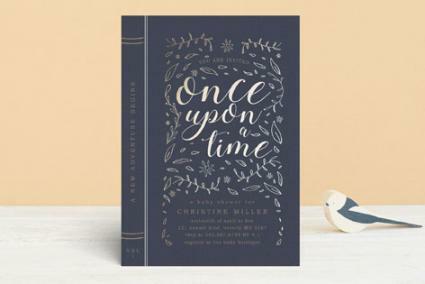 The perfect invitation for a fairy tale shower is the Royal Book Foil-Pressed invitation from Minted. This single-color and gold foil invitation looks like the cover of a book that reads "Once Upon a Time" on the front and comes in your choice of black, pink, forest green, canary yellow, or teal. You can also add a picture to the back of the customized invitation. The cost is just over $100 for 45 invitations. To really make guests feel like they are in a fairy tale, decorate the room like a castle. This could be as simple as creating Gothic window shapes out of posterboard and decorating them, or it could be as elaborate as a castle photo background from Stumps. These giant castle posters start at about $30. Give guests a little gift that's practical but also perfect for the theme, such as crown bookmarks from FavorFavor. These silver metal bookmarks have elegant white tassels and retail for less than a dollar each. Use edible gold lustre spray from PME Sugarcraft to transform a bowl of cherries or apples into a tasty golden centerpiece that guests can eat. The paint costs about $16 per can. Have the bakery make a cake that looks like Cinderella's carriage sitting on top of an open book. Serve crown-shaped sugar cookies from your local bakery. You can also make them yourself with a crown-shaped cookie cutter, which is available for about two dollars from ShopBakersNook.com. One great activity for this type of shower is to have guests create a special keepsake fairy tale book for the baby. Purchase a fairy tale collection, such as The Golden Book of Fairy Tales, and have guests write their wishes for the baby inside the front and back covers. A nursery rhyme shower is another fun theme related to books. This idea is ideal if the mom-to-be is decorating the baby's room with a nursery rhyme theme, but it also works for any new mom who's excited about reading to her baby. 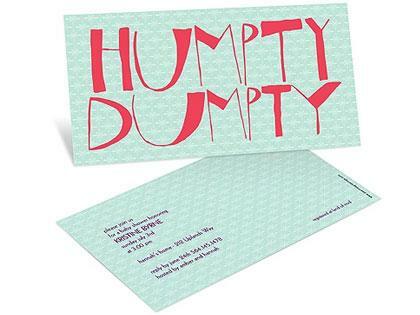 For a modern take on this classic theme, choose the Nursery Rhyme invitation from Pear Tree Greetings. This card features the names of favorite nursery rhyme characters in a whimsical font on a soft blue background. They cost about $26 for 24 cards. Make your own decorations using free nursery rhyme clip art from Homemade Preschool. You can print the clip art to create banners or hang several pictures from strings. For this type of storybook shower, choose the Over the Moon Bookmark favor from Paper Palace. The gold-colored metal bookmark comes in a book-shaped box with a personalized sticker. They cost a little over two dollars apiece. Three Blind Mice, also known as whole strawberries with slivered almond "ears" and toothpick "tails"
Use your computer to make an easy nursery rhyme word search with the names of common characters scattered amid random letters. You can pass these out to guests and then see who can find the most characters within a set amount of time. You can also play other free printable baby shower games such as "Quick, Name a Nursery Rhyme!" 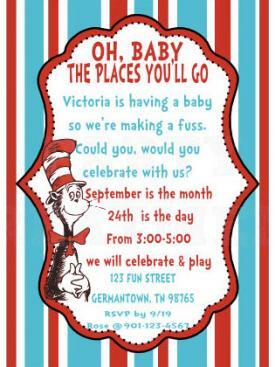 If the mom-to-be has a great sense of humor and loves Dr. Seuss, it's hard to beat this type of storybook baby shower. You'll find plenty of inspiration in these classic works of children's literature. For a great selection of Dr. Seuss invitations, check out the artist marketplace Etsy. You'll find cards that come printed, as well as files you can pay to download and print yourself. Prices range from about $10 for a downloadable file to $55 for 25 printed cards. There are dozens of different options to choose from. You can also make your own invitations using free Dr. Seuss fonts. For decorations, go with the classic Dr. Seuss colors of bright red and bright turquoise with pops of yellow. Add in some classic Seuss-themed decorations from Etsy in a wide range of prices. Don't forget to display lots of Dr. Seuss books for everyone to enjoy as well. Let the Dr. Seuss color scheme inspire your favors as well. Purchase turquoise and red jelly beans and fill up small cellophane bags. Tie each with a yellow ribbon and a note thanking guests for coming. It wouldn't be a Dr. Seuss shower without green eggs and ham. In addition to typical baby shower food, have a plate of green deviled eggs and diced ham with toothpicks. To make the green deviled eggs, simply add a little blue food coloring to the yolk portion in your favorite recipe. If the mom-to-be already has everything she needs for her little one, why not host a shower to help her build the baby's library? Guests can come bearing lots of great children's books as gifts. You can't beat the Build-a-Library invitations from Etsy seller Party Print Express. This adorable design looks like a library card and can be customized with your information. They cost $45 for 20 cards. Be sure to include a note asking guests to inscribe the book or books they bring. Place bouquets of fresh flowers on top of stacks of books. These make great centerpieces for a sitdown event, or you can use them to decorate the cake table and other important surfaces. Another great idea is to paint a small wooden bookcase in a color to match the baby's nursery. When guests arrive, they can place their gift books on the shelves. You can also make a pennant banner out of old book pages from the thrift store and hang in above the buffet. Make a simple beaded bookmark to give each guest as a favor. This is a fun project and is a creative way to thank the guests for sharing in the event. Serve Swedish meatballs with toothpicks next to a sign that says, "Cloudy with a Chance of Meatballs." Offer a plate of cookies with the label "If You Give a Mouse a Cookie." Have a plate of miniature blueberry pies with a sign reading "Blueberries for Sal." Serve pound cake slices with a selection of fruit toppings and the label "Bread and Jam for Francis." One fun activity is to make a book for the baby. Choose a theme, such as the alphabet or numbers, and have guests each make a page. For instance, if you choose an alphabet theme, give each guest a letter. She should then work on the page for that letter. If the guest received the letter "L," she could write "L is for lollipop" and draw a picture of a lollipop. Always make your expectations clear to guests. If you want them to bring a book, make sure that information is on the invitation. Similarly, if you'll be doing books instead of traditional baby gifts, make sure you communicate that. Before deciding on a specific storybook theme, make sure the idea you have in mind works for the mom-to-be. This is especially true if you are doing a build-a-library shower since she won't be receiving traditional gifts. Don't stick to the theme if it doesn't work for you. You might find different favors or decorations you love, and it's perfectly acceptable to make a departure from the storybook theme you've chosen. Simply mix and match ideas to create your perfect event. Planning a storybook shower is a lot of fun, and the guest of honor will remember this event for years to come. Long after the gifts have been opened, the cake has been eaten, and the games have been played, she'll be able to share the joy of the event with her baby as they read these special books together.